In our February issue, we chatted with Dustin Hurt of the Discovery Channel series Gold Rush: White Water. You can catch a new episode tonight (check local listings). Dustin Hurt is the exception to the rule: the transplanted Alaskan who’s not here for the salmon. The Last Frontier’s gold is on Hurt’s mind. He’s been mining the state for years now and has been chronicled on the Discovery Channel shows Gold Rush and now Gold Rush: White Water. The show recently premiered its second season following the “Dakota Boys,” Dustin, his dad Fred Hurt (Alaska Sporting Journal, March 2018) and their crew’s ups and downs seeking riches on McKinley Creek, a rugged and treacherous stretch of water in Southeast Alaska. Dustin and Fred both have ties to Louisiana – Dustin’s accent is straight out of A Streetcar Named Desire central casting – where fishing both inland waters and the Gulf of Mexico is a way of life. Yet Dustin’s time in the Last Frontier doesn’t include casting for the state’s iconic fish. 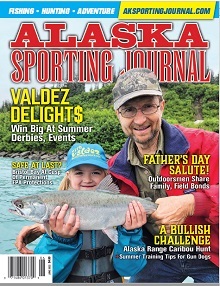 But while some anglers may consider Alaska’s sockeye, coho and Chinook to be worth their weight in gold, the Dakota Boys are after the real thing. We asked Dustin Hurt about his obsession to strike it rich, plus his rather diverse backstory of growing up as a troublemaker in New Orleans and his redemption as a hard-working gold miner. Dustin wearing dive suit at McKinley Creek. Chris Cocoles What has your Alaska experience been like given the highs and lows gold mining are sure to create? Dustin Hurt I think I experienced Alaska differently than most people do when they come up there, because I go to some of the hardest-to-get-to places in this land. Some of the places have been explored but don’t get a lot of traffic. It’s led to me to love the area, but everywhere we go we have to try hard to get there. There’s no easy way to do anything here. I was born and raised in New Orleans, (where) everything’s flat and you can pretty much ride a bicycle through it. So it’s quite a change. CC Has the state driven you crazy a few times and has it been an exhilarating place at the same time? DH I’ve done a lot of different things in my life and this is the one thing that I keep coming back to. Because it makes me feel great about myself. I love to work hard – I’m a construction worker – so this kind of combines all the things that I’ve done in my past all into one, with an adventure ahead of it. Every day you really don’t know what you’re going to get. It is dangerous; we try to mitigate everything we can, but it does just make it exciting as hell. Every day is kind of a new adventure. CC When I talked to your dad last year, he talked about what an amazing place McKinley Creek was. Is that how you see it? DH I hiked through these (mining) claims many years ago and I fell in love with the difficulty of them. The place is trying to shut you down every day. Every time I go to McKinley Creek it feels like there’s something there trying to stop you from being there. And it’s a fight to the finish. To try to have the lowest impact and try to mitigate all the dangers is a daily goal. I don’t know; it’s just been one hell of an adventure. It maxes out your creativity every single day. Dustin Hurt & Fred Hurt. CC During the last season of mining McKinley Creek, you and your crew had to endure a landslide and subsequent flash flood that damaged your mine site. How did you handle such a letdown in a project that surely sees a lot of highs and lows? DH It’s hard to explain what it feels like to spend months and months and months doing just grueling hard work with just the most difficult uncertainty after pushing forward, and then in an instant, it just all gets taken from you. From all the lifting and the pulling, the countless hours, it kind of crushes your heart when you see it happen. It can be taken away in 20 seconds. It’s incredible to see and feel it. I don’t know how else to explain it. It would have to be like building a house and just about to finish it and it starts to burn down. It definitely pulls the heart from your chest. CC You can probably react to something like that multiple ways, from being discouraged enough to walk away or motivated to go back and try again. I can guess what you got from it. DH In my life I’ve found out that there are two different types of people: People who use failure as an excuse or who use failure as inspiration. And I fall into the latter category. When something challenges me I really like to try to complete my task – whatever that might be. To fail or win, I just want to do it the best I can. I’m not proving it to anyone else but myself. I need to know that I can do it. It’s something deep inside me that has to come out. I don’t know how to begin any other way. CC Your dad told me that you had some tough times personally growing up around New Orleans. Was there a turning point for you that changed your life for the better? DH The turning point. It’s been a gradual battle to figure out who I am. I was definitely raised in an area to where I could have definitely gone the wrong way, and was headed that way for sure. But I got turned around somehow and it was a gradual exposure to literature and different experiences; traveling; seeing my little world from an outside vantagepoint while stepping out and seeing different countries. I forced myself to do these things to look inward and see what was actually happening in my life. It opened up a whole new world that I knew I had to have a piece of. I’m still expanding my knowledge of the world and looking at my tiny life seeing how I can make it better. CC You probably had to be pretty tough as a New Orleans native. DH I grew up with tough knuckles. I learned to fight at a very young age. I don’t like to fight as an adult and I won’t do it. But what it did do was give me some sort of drive to know that I did not want to be a part of that world – the street hustles and all those types of stuff that I grew up around. New Orleans can be a pretty harsh place where I was. It did give me an outlook on life that a lot of people don’t get to see. I did grow up fighting and as an adult, I think I can look back and say it did make me as tough as nails. But now I’d rather use my mind instead of my fist. That’s what I’m doing now. CC Part of your life journey was spent in California fighting wildfires as a hotshot. What was that experience like? DH I moved to California when I was 24 years old and joined the hotshot crew and fought fires for maybe four years in different areas. It was a perfect match because I was used to the heat, being from New Orleans. Most of the people around me couldn’t stand heat as well as I could. I was accustomed to it. What they thought was really hot standing next to a fire with a chainsaw, I was pretty comfortable. With my fitness level at the time, that made me perfect for the job. I excelled for a couple years fighting wildland fires. It was some of the hardest work I’ve ever done in my life. Every time I see one of these fires I think about the work that it takes to put them out by hand. It’s absolutely incredible what a group of people can do with some hand tools and chainsaws in putting out a fire. It taught me that with a good group of people, you can almost get anything done that you need to get done, and faster than you ever thought it could happen. (From left to right) Carlos, Wes, Fred, Rich, Dustin + Paul in the water at McKinley Creek. CC How did you react over the last year or so given that many places in California have been devastated by these blazes? DH Well, I don’t want to come across as insensitive in any way, but for me being born and raised on the outskirts of New Orleans, we flooded constantly. Almost every year people would lose houses by the hundreds. Finally a big hurricane (2005’s Katrina) came through and almost wiped out the whole city. It’s just been a part of my natural life watching natural disasters. With fires, I’ve seen the destructive force of it and it can be the equivalent of a real big hurricane. When I see it I can sympathize with the people, but I’ve become so accustomed to losing stuff – I’ve lost seven vehicles to floods as a young adult. I can understand how it feels to lose all your things and people dying because of these natural (disasters), and it’s horrible. I’ve just become used to natural forces destroying things. That may sound harsh, but I just see it that way. It’s a horrible thing but part of living on this earth, as far as I’m concerned. I’ve never lived in a place that doesn’t have its dangers and you just have to prepare the best for them and get out of the way when you can. CC Is it safe to say that your time in Alaska and gold has changed your life and your dad’s life? DH Well, I was on track after the fire crew to be a construction worker. It’s always my fallback to be a construction worker. And now that I’ve found adventure in the mountains and something I truly love to do, it’s made me a different person. I have to think out of the box constantly and I don’t just have to put my head down and dig ditches. It’s attracted me to Alaska in a way that I had no idea that I would love a place. Sometimes you just hate it because of the weather, and the ice gets there way too fast. Sometimes the rain doesn’t stop for months. Then when it’s beautiful out you just fall in love all over again. It’s a love-hate relationship, and Alaska’s been really good to me. I love it here. I see it forever changing my world. CC Can you share some experiences about the wildlife there – specifically all the bear encounters you’ve had in Alaska? DH [Laughs] There have been a lot of bear encounters up there with us – some of them stranger than you can ever imagine. Sometimes we’ll get these juvenile bears that are just bullies. And they just won’t take no for answer. And my crew and I were against shooting the bears, so we haven’t harmed any. But man, has it come close? Bluff charging and sometimes they want to take over an area. You almost have to hit him with a stick or a rock or something to get them to respond at all. We’re not going to shoot them unless we absolutely have to. But there have been a few times where I wish the film crew was around for some of these instances. Because we get bears that don’t know that you’re not a bear. They’ll run into you on a trail and they’re really young bears by themselves. And they want to test you, so they’ll bluff charge you, they’ll stop, run back, roll around, climb a tree and they’ll want you to come and play. Then they’ll bluff charge you again. You’ll just look at this bear and say, “What are you doing?” And you realize that it doesn’t know if you’re a young bear because it’s never seen a human before. And this bear wants to play and then wants to challenge you, and then it doesn’t know what to do. It’s not afraid of you; it’s just confused about what you are. You’re just an upright, skinny pink bear to them. And they want to play and then they want to fight. Thankfully we’ve never had to hurt a bear, but they get ornery, especially when the berries aren’t out and they want to come into your house or your tent. They just won’t take no for answer. Sometimes you have to put up the little electric fences to stop them. CC Tell me about your relationship with your dad. On camera you guys seem to live for arguing and bickering with each other. But is that relationship also stronger because of it all? DH Well, every season is a surprise for Fred and I. I worked for him for nine or 10 years when I was younger and he taught me quite a lot of stuff. I got a lot of my construction skills from him. We fought tooth and nail back when I was just a young dumb fella. Now we even fight worse sometimes. I often start every season wondering if we’re going to be friends at the end of that season. But we keep working together because we see value in each other’s minds. Because even though he has some crazy ideas, one in 20 of those ideas is brilliant and I’d never be able come up with it. It works perfectly. But those other 19 ideas can be absolutely ludicrous. I think he enjoys fighting with me to a point and I (do) too, just a bit. I don’t know that we communicate like normal people do. There’s no one on Earth I would communicate like that to and still be able to stay around him. So somehow we have this way of communicating that’s understood that we’re gonna be a little rude to each other. That’s just how it’s going to be, and we both accept that. We’re not offended and one year we’ll come away and swear we’re never going to talk to each other again, and the very next season we’re best friends. It’s just the weirdest situation ever. CC Without giving much away, what can viewers expect from the Dakota Boys this season on Gold Rush: White Water? Editor’s note: New episodes of Gold Rush: White Water air on Friday nights on the Discovery Channel (check local listings). For more on the show, check out discovery.com/tv-shows/gold-rush-white-water.